Cameroon international utility man Geremi has joined Newcastle from Chelsea on a free transfer, after being granted a work permit. The 28-year-old had already agreed personal terms and passed his medical. Geremi said: "I am very, very pleased. This is a big club and a great club, with passionate fans and I look forward to playing for them. "I was impressed with Sam Allardyce too, with what he has done and his knowledge. It's a great move for me." Excellent signing, well done Big Sam! Geremi, who can play at right-back or anywhere in midfield, was wanted by several Premier League sides. Newcastle boss Allardyce has already signed midfielder Joey Barton, striker Mark Viduka and defender David Rozehnal this summer. 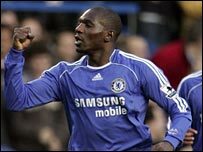 Geremi had been at Chelsea since 2003, making 72 appearances for the London club and scoring four goals. He spent the 2002-03 campaign on loan at Middlesbrough from Real Madrid and had previously played for Racing FC Bafoussam in Cameroon, Paraguayan side Cerro Porteno and Genclerberligi in Turkey. Geremi made his debut for Cameroon in 1996 and has been capped 60 times. Boss Allardyce is delighted with his signing, saying: "We have signed a player who is a real winner and who has played on the biggest stages for both his clubs and his country. "He's been at Real Madrid and he's been at Chelsea, two of the top clubs in Europe, and that tells you he must be a quality player. "It's a great bit of business for us and he's very keen to be successful at Newcastle United, as we all are in the times ahead." He added: "I still think that when you are targeting players like Mark Viduka, Joey Barton and David Rozehnal, you have to stave off a lot more competition than we did with the sort of players I was bringing in at Bolton. "That makes it hugely difficult. You have got to do a lot of selling of yourself and the football club in terms of what you are trying to achieve. "I think we have done that extremely well given the sort of competition we were up against for all three players. "The one particular disappointment was we could not stave off Chelsea with Tal Ben Haim - that's the size of the competition we have come across. "We could not quite persuade Steve Sidwell to sign either, and he went to Chelsea. "We have had some disappointments, but I think the three signings we have made in a short space of time have been massive moves forward for the football club."